The piece lays out some strong indictments of capitalism and the focus of web 2.0. To be honest, that’s pretty damn offputting for me. Socialistic urges don’t interest me. But Fred Wilson is a smart guy, so I decided to read through Umair’s post and all the comments. I really wanted to know what he meant by “organize the world’s” problems. Bloggers are the online equivalent of “ladies who lunch”–a bunch of rich people chattering amongst themselves about how they’re going to spend their afternoons. See the similarity? Two vastly different industries – finance and media – were both revolutionized by new DNA. It was new ways to organize and manage that exploded the boundaries of value creation. Yes, that looks like most social media sites. Hence the web 2.0 angle. But it’s hard to apply this model to heavier, capital goods sectors. Google applies the above model to digital information. Microcredits apply the above model to digital currency transactions (until the “last mile” where someone actually needs cash). Capital goods aren’t as easy as transferring digital information. Moving water is capital intensive. Energy production and transfer is capital intensive. Agriculture is capital intensive. These don’t lend themselves well to the disruptive flows that digital information does. With oil and gas prices through the roof, I want to stay on that problem. There are two ways to read the New DNA when it comes to energy. Not bad, it puts conservation at the forefront. And you could compare your usage to that of others. In #2, people would actually provide power to the organizing entity. Well, that becomes more capital intensive. Honey, we’ve left the web. The friend I refer to in my comments on HN: he’s a grad student who has built a small-scale digestor that can convert any type of waste — human/animal/food — into usable energy. He is not a guy for hype, but he says it could technically replace every septic tank in America. That’s huge. I don’t how real that idea is. Sounds promising. How much energy would it really produce? My dinner scraps probably won’t power much. In that comment though, I do see that there are people much more learned in the field of energy than me. So I won’t discount the possibility that individuals could create new sources of energy. But it does seem like a stretch, just based on my physics courses where we learned about the law of conservation of energy. I don’t where the untapped energy sources are around my house. So we’ll see what Fred comes up with over the next year or two in relation to Umair’s post. 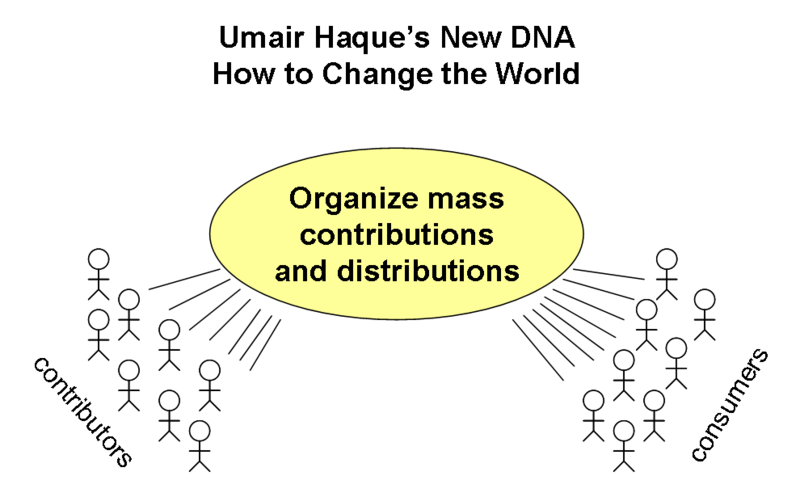 Was Umair’s manifesto more feel good exhortation or the start of innovation desperately needed in a number of areas? Powerful and provocative thoughts will lead us all to a better understanding of the mechanisms needed to fix some of these, if not all, large issues. I couldn’t agree more with the statements put forth regarding “socialism.” Systemic redistribution is not viable. Capitalism works because we work capitalism. When we are a better informed community, the ability to move capital towards solutions will occur faster and with more verifiable results. Ideas like kiva.org work because many have the opportunity to invest a little for the greater. Orgs like one.org work because of the action of the community. The “socialweb” has a conscious if we want it to. I’ve never believed that we didn’t have a will to change, but the opportunity for involvement was elusive and took too much time and money for the average individual. Now as a member of a group of like-minded individuals our contributions add up to something much bigger than ourselves. The barriers that once prohibited response are removed and the empowerment of great ideas are facilitated. I want to celebrate the micromodels that spawn micropayments and result in moving BIG ideas forward. There is a balance here that works. Dennis Weaver, who coined the word Ecolonomic, once said- “We don’t have to sacrifice a strong economy for a healthy environment.” I would add- Without a strong economy, our ability to make positive change is greatly hampered. Weaver also said- “Business has to change the way it does business, or we will make no significant changes in the way we relate to the earth.” I agree with Jeffery Sachs when he states- “The essential truth for developing countries is, if you try to live by yourself, you will cut yourself off from the amazing progress of world technology. You won’t be able to purchase the goods that you need from abroad, because you’re not exporting to the rest of the world. You have to be part of the world system.” The focus here seems to be responsible economic empowerment and development. Web2.0 should be about moving BETTER ideas to those who need it FASTER. Thank you for this post and keep on thinking BIG.